Workplace occupations – sometimes also known as workplace sits-ins – have an iconic status within the annals of the international labour movement. Examples from the last upsurge of workers’ struggles are the Upper Clyde Shipbuilders’ (UCS) work-in in Scotland between 1971 and 1972, the Lip watch factory in France in 1973, and the Harco steel plant in Australia in 1971. More recently, are the waves of occupation in Argentina in the early 2000s as well as occupations at Republic Windows and Doors in the US in 2008 and 2012, the Ssangyong car factory in Korea in 2009, and the Triumph underwear and lingerie factory in Portugal in 2018. These examples may be inspiring for far left activists and labour historians as examples of workers’ power. But since the beginning of the new millennium and the great financial crash especially, in Britain, at any rate, there has been a dearth of workplace occupations even though plant closures and mass redundancies have abounded. This suggests workplace occupations are not seen by most workers as a credible method of collectively defending their jobs and livelihoods in times of crisis even though the tactic allows workers to exercise more influence from inside the workplace than by walking out on strike through more ably controlling the movement of labour, materials and goods than by (external) picketing. 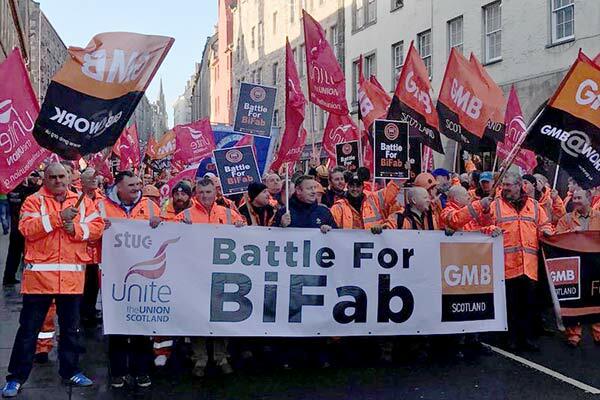 As I argued in a recent paper, the successful occupation and work-in at Burntisland Fabrications (BiFab) in Scotland in 2017 can be used as a lens by which to reconsider the usefulness of the tactic today. This is critical to understanding the context of when and why the process of occupation can result in a victory for workers. For a week in late 2017, workers at three fabrication yards staged a work-in and occupation in response to BiFab announcing it was entering administration as a result of only being paid 40% for the work it had carried out for its client, Seaway Heavy Lifting (SHL), which had been contracted by energy provider, SSE, to build an offshore wind turbine farm. The workers faced both not being paid their due wages and mass redundancy. In order to put pressure upon SHL and SSE as well as the Scottish Government (which has a green energy policy and licensed the offshore farm), workers agreed to work without wages with the purpose of continuing production of the jackets for turbines while also taking control of the yards. The work-in was used as a legitimatizing tactic for the occupation, whereby the workers sought to show that they, the victims, remained willing to work. Management did not obstruct the occupation and work-in, owing to their temporary alignment of interests with the workforce, namely, to gain payment from SHL and SSE for the work done. A high profile, large demonstration was held outside the Scottish Parliament, crowning extensive media coverage during the week. Many on the left concluded that direct action works. But this shows a deficiency in understanding the interaction of processes and outcomes at work and the specificity of the conditions under which they operate. With BiFab, there was significant group cohesion, the creation of a usable bargaining asset, the ability to create political pressure, buoyant product demand, and the strategic importance of energy infrastructure. Identifying and understanding the existence of such factors as well as their interrelations is as vital to understanding why collective resistance is possible and how it can be successfully deployed. It also points to whether such successes can be replicated in other instances because struggle per se is not guarantee of success. From this, it becomes evident that not all workers are as strategically situated in their workplaces. In fact, many are not. This helps explain why between 2000 and 2010 only 19 occupations and sit-ins were staged in Britain with 14 more (including the BiFab one) since 2010. The majority of cases saw workers gain some enhanced monetary compensation when employment was lost. Most of these occupations concerned issues of redundancy and closure but recently more have been about resisting changes to the terms of employment whilst employment continues. Indeed, many of them are now about protesting against changes in employment as part of a wider repertoire of collective actions (as in cases in the ‘gig economy’). They are as much about giving voice to discontent as they are attempts to create leverage in order to bargain with management, especially as such occupations are much shorter actions – so better categorized as ‘sit-ins’ of the ‘sit-down strike’ variety – and as unions are using leverage campaigns as a new form of trying to create leverage in disputes. To conclude, while the BiFab occupation (and work-in) serves to highlight the paucity of the occupation tactic, an examination of its dynamics indicates the tactic is more likely to be used in situations where: (1) continued employment and the employment relationship are threatened, (2) there are available employer assets to generate leverage from, and (3) there is possibility of exercising political leverage to force government intervention. The sit-in has been used more as a means of increasing pressure upon employers by being a particular form of strike action where neither the continuation of employment nor the continuation of the employment relationship are at stake. The approach adopted here in analyzing the nature and purpose of the workplace occupations is consistent with the mobilization framework. This is especially so in terms of the understanding the consequential steps in the process of turning anger into the hope of gaining redress through taking action, where workers undertake a cost/benefit analysis of action and inaction including opportunity costs and windows of opportunity to act. Gregor Gall is a visiting professor at the University of Leeds, editor of Scottish Left Review and director of the Jimmy Reid Foundation.